Raw Apple Cider Vinegar is an ancient remedy. For generations it has been the staple of medical practices and now in today’s modern world these secrets are being rediscovered. 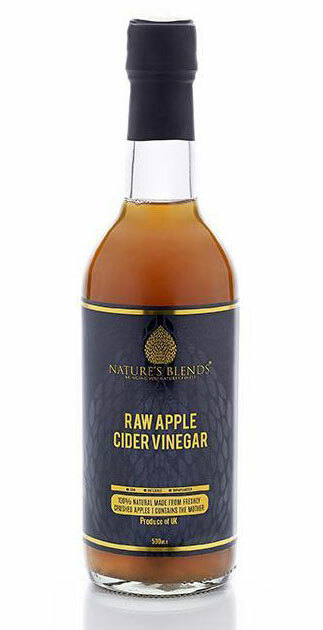 At Natures Blend’s we live for good health and nothing promotes good health as well as Raw Apple Cider Vinegar. Raw, unfiltered vinegar retains the sediment and ‘mother’ threads which convey the majority of any vinegar’s healthful properties. We are also of the opinion that any unnecessary processing is harmful to a natural food product, so we avoid any processing that does not provide a clear benefit to you. There are many health benefits of Apple Cider Vinegar, but here are a few that will make you want o have this bottle of goodness in your home. These are just a few of the amazing benefits of apple cider vinegar, it’s even known to help those that suffer with gout to cut down the frequency and severity of gout by up to 80%. There are tons of other benefits of having apple cider vinegar in your home. Natures Blend’s Top Tip: Mix 2 tablespoons of apple cider vinegar in a glass of warm water with a teaspoon of raw honey and a teaspoon of black seed oil for a healthy and delicious tonic drink. To be taken every morning on an empty stomach. The romantic history behind the source of our olive oil is unique. High up in the Atlas Mountains of Morocco, where the Romans cultivated vineyards and olive orchards, are three farms with over one million olive trees that have been traditionally maintained to produce an amazing olive oil. The unique climate of the Atlas Mountains and land gifts the olive oil that remarkable fresh taste. The wind blowing between the olive trees whispers the history of this soil from which Greeks and Romans already produced their famous “green gold”. The three orchards located at the foothills of the Atlas are kissed by mild winters and summers, filtered by hot winds coming from the Sahara and the olives are gilded by an intense sun reigning on the plains of the Atlas mountains. This particular climate and the conditions of the land give our olive oil an unmistakable taste. With the climate being of optimal condition for the olives to grow, the water used is pure artesian water and turonian acquifere supplied by the snow melting of the Atlas mountains and trapped in a calcareous reef allowing natural water filtration. Constant monitoring of the cultivation and mechanized picking at an optimal ripeness with only a 20 minutes lapse between harvest and grinding. The olive oil is exclusively extracted through a mechanical process in a low temperature continuous line to get excellent extra virgin olive oil with 0.2% maximum acidity. The distinctiveness of our oil lies also in the attention to detail during every phase of the production process, the selection of a highly skilled workforce and the use of European technology and know-how. All this gives life to a wonderful olive oil you can find only in the best international gourmet stores. Our oil is characterised by an integrated production. It is a methodology of farming techniques that fulfils consumer requirements (total quality of the product, food safety and total traceability) while respecting the environment (conservation of the ground and saving of water) and by involving all of the people concerned in the production of an oil of prestige: the farmer and his team, operators of the oil mill, and the bottler. The olives used to create Nature’s Blends Olive Oil are harvested at the end of September-beginning of October – just when the olives are changing colours and ready to give away their wonders. Our olive oil is an ultra-premium extra virgin olive oil with 0.2% acidity and a unique taste. The optimal soil conditions, pure water, high density of trees, high quality olives alongside the unique climate of the Atlas Mountains is responsible for the unique ultra-premium oil. 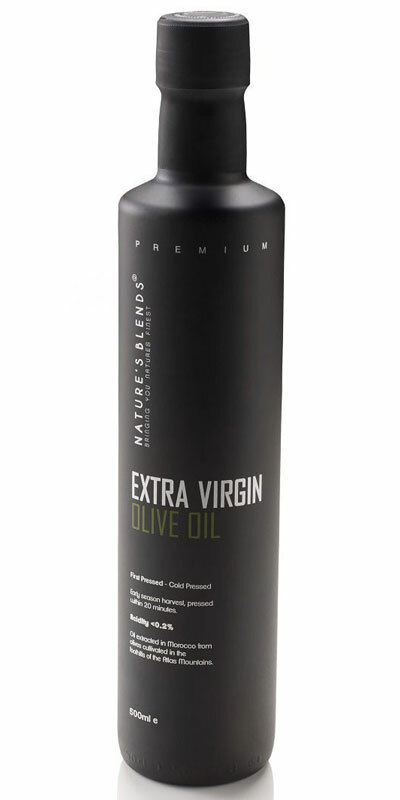 Extra Virgin: The way olive oil is classified as “extra virgin” is by cold-pressing ripe olives. This method involves only cold pressing once in order to maintain its freshness and natural elements. No added heat, chemicals, ingredients, or preservatives that destroy the amazing nutrients found in olive oil. The colour of the olive oil is also a deeper golden colour which signifies the ripeness of the olives and its quality. Harvesting and producing olive oil is by no means a new method. Rather, Olive Oil was an integral part of the diet and beauty regime of ancient civilizations such as Egypt, Rome, and Greece that are still widely used today. We can even find sources leading back to religious text urging the consumption and use of olive oil. Decrease blood pressure – Various health studies recommend 4 tablespoons of olive oil a day to reduce blood pressure. Controlling Blood Glucose Levels – The presence of monounsaturated fats in extra virgin olive oil can help regulate blood glucose levels and improve insulin sensitivity. The American Diabetes Association has shown that a mediterranean diet that is rich in extra virgin olive oil consumption can reduce the risk of type 2 diabetes by almost 50%. Cooking with olive oil reduces the risk of obesity due to the presence of healthy fats and nutrients in the oil. Prevents High Cholesterol – Studies have shown that consuming 2 tablespoons of extra virgin olive oil daily can help lower high cholesterol. Improve Skin and Hair Health – the silky texture of olive oil due to its natural antioxidant properties. 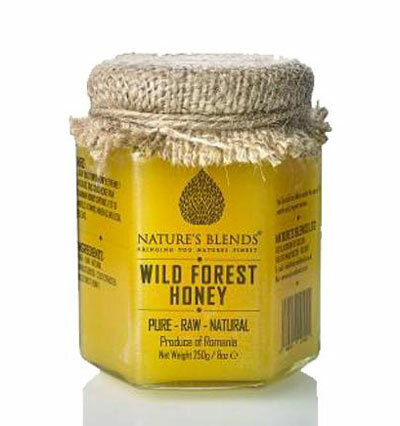 Wild forest honey sure sounds exciting doesn’t it, but what makes it so popular? Made from an array of natural, high-quality ingredients this pure honey is another great first choice for people new to luxury honeys. It offers a sweet yet subtle fine flavour with a zesty and tangy edge! It’s the perfect balance of flavours and together forms a harmonious honey that is great for cooking with. 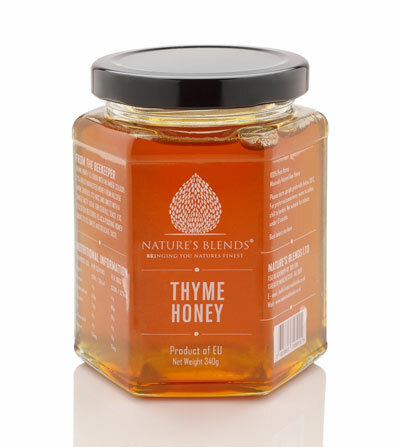 With a slightly thicker consistency but a smooth taste this is a honey anyone will adore. A great balance of flavours. A wondrous alternative to syrup. Made with wondrous high-quality ingredients. What could be better than our pure raw honey? While pure raw honey with a twist of lime of course! Harvested in Romania and using only the finest natural ingredients our lime honey offers you a stunning flavour that you’ll never forget. With a sharp and unique aroma this is a honey that is a joy to all the senses and is a beautiful golden colour. Fruity with hints of citrus and a tangy full taste this honey is perfect for fruit lovers and the perfect extra ingredient for a number of popular dishes. 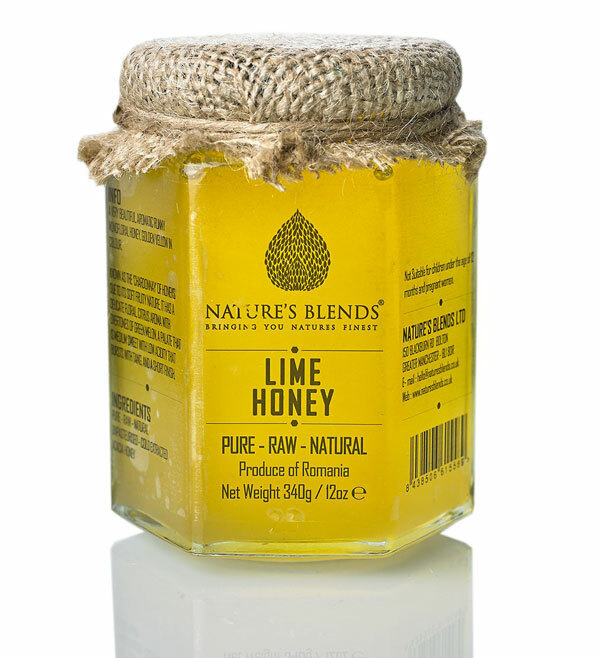 Whether it’s being served alongside a salad at a barbecue, with a hot cup of tea or you’re simply enjoying a spoonful on its own our sparkling pure lime honey will always taste amazing. Offers a sharper more citrusy taste. A bewitching and enticing aroma! The Sidr tree has been sought out for more than just its honey. The use of its leaves, bark, and flowers have gifted people various medicinal and beauty benefits . The leaves mixed with warm water were used to treat swelling of the eyes and bloating of the stomach. Similarly, the leaves were crushed and mixed with hot water to create a foamy consistency to be used as an herbal shampoo to rid dandruff and a natural exfoliant body scrub. Of course, for decades, harvesting honey from the precious flowers of the old historic sidr tree is the most revered method. Our Sidr Honey is sourced from the historic lands of Yemen from the Sidr Tree. 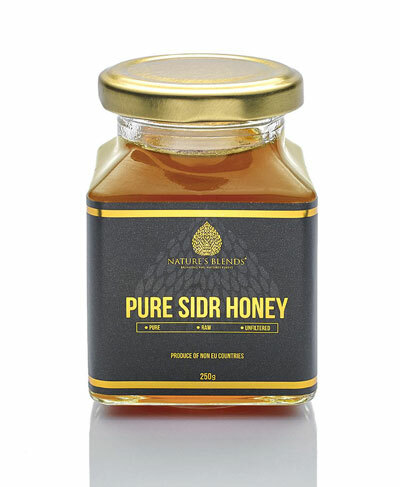 The sidr tree can be found in other parts of the world such as India, Pakistan, Sudan, and Ethiopia – However, the Yemini Sidr tree has become more sought out for its honey due to its superior quality and traditional harvesting methods. The beekeepers of Yemen use traditional methods of harvesting from the Sidr flower and delicately preserve every bit of its precious honey. Strong antioxidant and antibacterial– Research has found that darker honey’s generally have higher antioxidant and antibacterial properties. Natural Ointment – apply honey to an infected or burned area. The cooling sensation and natural elements bring comforting healing benefits. Balance Blood Glucose – Unlike your average everyday sugar, honey has a much less glucose and sucrose content which makes it an ideal treat for diabetics. Heals stomach ulcers – the cooling temperature of honey is able to tame and treat hot infections/areas in the body. Treat chronic cough – honey has been shown to be a natural cough suppressant especially for children over 2 years of age. Boosts the immune system – the unique antioxidant and antibacterial properties helps improve the immune system by ridding toxic buildup in the bloodstream. Clears acne – Due to honey’s natural anti-inflammatory properties, it can reduce and rid the appearance of acne that is triggered by a buildup of bacteria under the skin. An alternative to combat unhealthy sweet cravings- This is due in part to honey being low in calories, sucrose, and glucose. An increase in unhealthy calories due to processed foods and sugar can lead to more consumption because the body does not absorb these sugars and provide sustainability. Honey can curb the need for constant sugar in the body by balancing out glucose in the system. The perfect moisturiser and protector for your skin, hemp oil is non-comedogenic, meaning that it allows the skin to breath and doesn’t block the pores. It moisturises deeply, encouraging the growth of new cells, whilst softening and rejuvenating the skin. Our organic hemp moisturising oil come in two blends – this one – ‘Relaxing’ with floral tones of lavender, bergamot and geranium or our other blend ‘Energising’ with frankincense, grapefruit and peppermint. The nourishing combination of hemp with fragrant aromatherapy oils is perfect for massages. Vitamin E, healthy fats and 100% natural: this body moisturiser even carries a natural SPF of 8-10 so it provides a low-level sun protection and also great as a sunburn remedy as it provides calming and rejuvinating effect for the skin. It also can be beneficial for various skin conditions. The unique combination of Essential Fatty Acids found in Hemp seed oil closely resembles the skin’s natural lipids and therefore has the most beneficial therapeutic effects. Hemp Moisturisung Oil also contains Vitamins A, D and E which help prevent premature aging and skin disorders by providing nourishing moisture to all types of skin. These moisturisers are perfect to condition hair and beard as it protects the follicle from splitting. Just rub a few drops between your hands and work it through the hair. 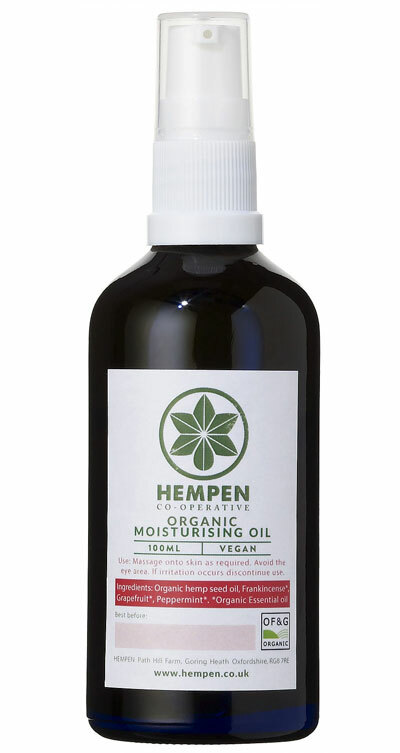 Massages with hemp oil products can improve blood circulation in the head and provide nourishing moisture to the scalp. 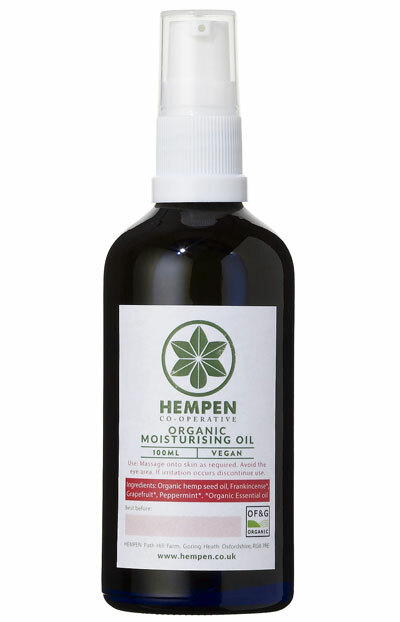 Hemp oil can also help thicken the hair texture, moisturise dry hair and prevent dry scalp and dandruff. The Hemp Oil is hypo-allergenic and has virtually no side effects, whilst giving the skin a healthy young look and natural glow. Recommended Use: Spray and evenly spread over skin daily. As a scalp moisturiser sray and massge into the scalp beofre washing. As a hair conditioner, after washing spray a small amount onto hair and comb thoroughly. 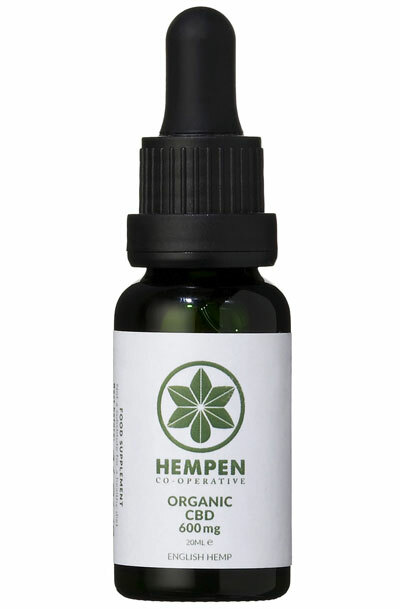 Our 10ml CBD 300mg bottle contains over 3% of the complete essential oil of hemp, infused in our own cold pressed virgin hemp seed oil, containing a minimum of 300mg of CBD per bottle. A highly beneficial nutritional supplement for mind and body, health and wellbeing. This is a full spectrum extract which contains the 100+ beneficial compounds found in hemp. These include CBD, a range of other beneficial cannabinoids and terpenes, omega 3-6-9 healthy fats and flavonoids. The combination of these unique compounds have been linked to having numerous health benefits. CBD interacts with cannabinoid receptors in your brain and body. These receptors form what’s known as the endocannabinoid system (ECS). The ECS play a crucial role in regulating our mood, appetite, digestion, memory, sensitivity to pain, hormones, motivation, sleep, and much more. It was only discovered in 1992, but the ECS is proving to be one of the most vital bodily systems. It would seem that its primary role is to help the body maintain balance. CBD is reported to have an anti-inflammatory, antispasmodic and relaxing effect upon the nerves and muscles, which can relieve physical stress in the body without imparting a psychoactive effect upon the mind. Hence, CBD is highly sought after for this soothing effect and the relief it can provide for those suffering tension in the body. In the UK CBD is perfectly legal and safe to use. CBD has no known side effects and is not addictive. We regurally lab test our CBD products to insure we produce the finest possible product, and all government regulations are being met. Hempen is a workers co-operative and we grow our hemp on organic certified farmland in an Area of Oustanding Natural Beauty in Oxfordshire. Having full control over the end-to-end processes we can guarantee unparalleled quality of our products and confirm that they are fully licensed and produced from 100% certified organic UK Hemp, Non-GMO, free of pesticides, heavy metals and synthetic cannabinoids. We recommend your own research on the benefits of this incredible plant derived supplement. There is a wealth of information available online however we make no claims concerning the medical application of our products. Our focus is on bringing you the best hemp products possible. CBD Oil is a perishable product therefore must be stored in a cool and dark place, away from direct sunlight and preferablyrefrigerated. This product is intended as a health supplement and may be taken to taste, however we recommend 3-6 drops applied under the tongue 1 to 3 times daily, or as otherwise required. 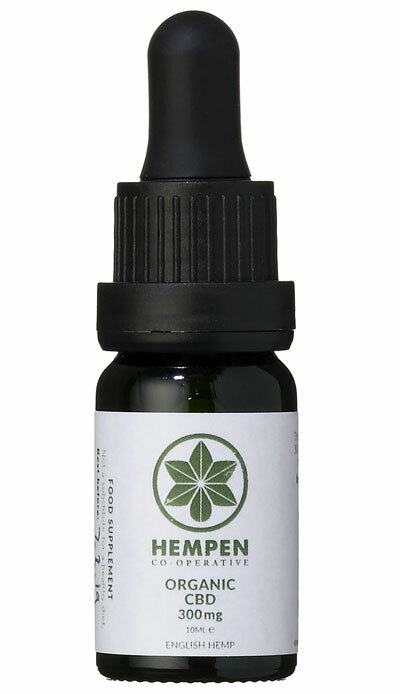 Our 20ml CBD 600mg bottle contains over 3% of the complete essential oil of hemp, infused in our own cold pressed virgin hemp seed oil, containing a minimum of 600mg of CBD per bottle. A highly beneficial nutritional supplement for mind and body, health and wellbeing. This is a full spectrum extract which contains the 100+ beneficial compounds found in hemp. These include CBD, a range of other beneficial cannabinoids and terpenes, omega 3-6-9 healthy fats and flavonoids. The combination of these unique compounds have been linked to having numerous health benefits. 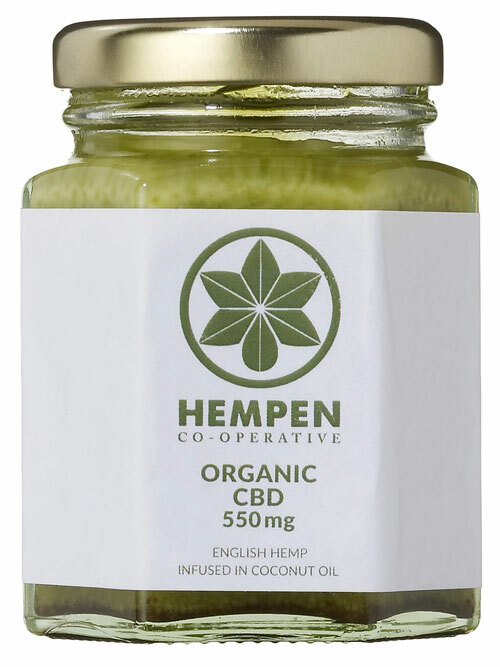 Organic Coconut Oil Double Infused with CBD (110ml jar). CBD (cannabidiol) is a non psychoactive compound most prevalent in hemp. The human body is widely populated with cannabinoid receptors. Cannabinoids such as CBD play a crucial role in regulating our physiology, mood and everyday experience. The CBD Coconut Oil is a unique blend of two of the most powerful natural super foods, hemp and coconut! An extremely versatile product it can be used orally as a health supplement and topically as a wholesome skin conditioner, massage oil and calming balm. Each 110ml unit of double infused coconut oil can contain over 550mgs of CBD. However, concentrations may vary from plant to plant and hence could be different in individual batches. CBD Coconut Oil is superior for nutrient absorption. It can dramatically increase the amount of nutrients you absorb, including vitamins A, D, K, & E, beta-carotene and CBD itself. Coconut oil is high in essential fatty acids, which act as a binding agent for the CBD. This product contains all the benefits of coconut oil plus the 100+ beneficial compounds found in hemp such as CBD and other terpenes, omega 3-6-9 healthy fats and flavonoids, the combination of which have been linked to having numerous health benefits. CBD Coconut Oil can be used topically, its amazing health benefits can still be felt as it absorbs into the blood stream through the skin. It helps relax the muscles, moisturises the skin and offers mild sun protection (SP4). It is very convenient to use considering it remains in a solid state at room temperature. Try massaging it into your feet just before sleep for a relaxing, stress relieving experience to feel well rested in the morning. The infused coconut oil is an excellent addition to hot food or drinks. However, it should not be heated above 120ºC as this will degrade the essential oil. CBD Coconut Oil is a perfect replacement for butter and other types of oil typically used in the kitchen. You can make smoothies, soups, dressings, stir-fry’s, sauces, and baked-goods with the infused oil. It is also gluten free, dairy free, and vegan. We recommend your own research on the benefits of this incredible plant derived supplement. There is a wealth of information available online however we make no claims concerning the medical applicatiopn of our products. Our focus is on bringing you the best hemp products possible. As a food supplement: one-quarter to half teaspoon eaten raw; stirred into a hot drink or massaged into skin 1-3 times a day. Our organic hemp moisturising oil come in two blends – this one – ‘Energising’ with frankincense, grapefruit and peppermint or our other option ‘Relaxing’ with floral tones of lavender, bergamot and geranium. Our Hemp Seed Oil is natural and unrefined, extracted directly from the seeds by cold-press in small batches to preserve its nutritional qualities. It is highly rich in vitamins A, B, C and E and packed full of nutrients. It’s considered “Nature’s most perfectly balanced oil”, due to the fact that it contains the perfectly balanced 3:1 ratio of Omega 6 to Omega 3 essential fatty acids, determined to be the optimum requirement for long-term healthy nutrition. The oil contained in the hemp seed is 75-80% polyunsaturated fatty acids (the good fats) and only 9-11% of the less desired saturated fatty acids making it the most unsaturated plant based oil. In addition, it also contains smaller amounts of 3 other polyunsaturated fatty acids in gamma-linolenic acid, oleic acid and stearidonic acid. The combination is unique among edible oils. The essential fatty acids contained in hemp seed oil are required in our diet more than any other vitamin, yet our bodies do not naturally produce them. 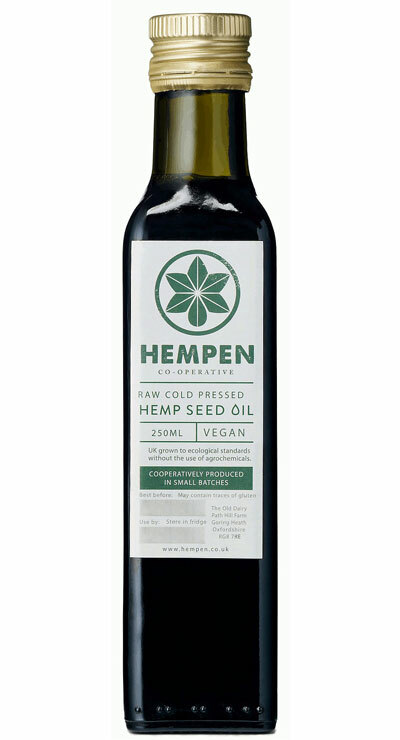 Hemp Seed Oil also contains antioxidants, phytosterols, phospholipids, chlorophyll and a number of minerals including calcium, magnesium, sulfur, potassium, phosphorus, along with modest amounts of iron and zinc. With a delicate texture and a distinctive nutty flavour similar to sunflower seeds, it can be added to any dish as a flavour enhancer and used in a wide range of recipes from sauces, dips, marinades and salad dressings. It’s also a great alternative to olive oil, butter and spreads. Recommended Use:As a nutritional supplement take a minimum of 3 teaspoons daily. Not suitable for infants under 12 months. To maintain the nutritious quality of this Hemp Seed Oil, do not use as a “frying” oil or heat above 120°C, keep bottles tightly sealed after opening and store in the refrigerator or freezer. Wet your child’s skin and use one pump of Tanamera Kidz Shampoo and Body wash. Carefully apply to baby’s hair and skin, rinsing well. 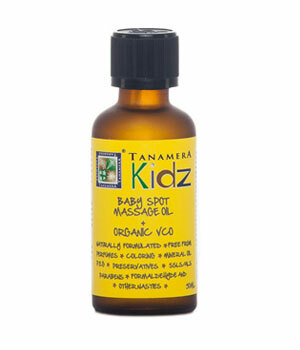 A massage a day with Tanamera Kidz Baby Spot Massage Oils + Organic Virgin Coconut Oil keeps the colic away. Both of you deserve a good night’s sleep. To be used specifically for baby’s abdominal area. Apply one or two drops on palm. Warm the oil in your hands and gently massage the oil in a clockwise direction over the abdomen. Start by rubbing Tanamera Kidz Body Moisturizer between palms vigorously to warm; apply on baby using gentle circular strokes.